Growing up on the west coast, there weren’t too many people that dressed as scarecrows for Halloween. I think it was an out of sight, out of mind thing, as we didn’t see a ton of them in our day to day lives. There was always that one kid though…That ONE kid that had a DIY scarecrow Halloween costume, and everyone thought it was THE BEST COSTUME ever. Being an adult scarecrow can be awesome too. You don’t have to show a lot of skin, and these items are SO ON TREND right now. 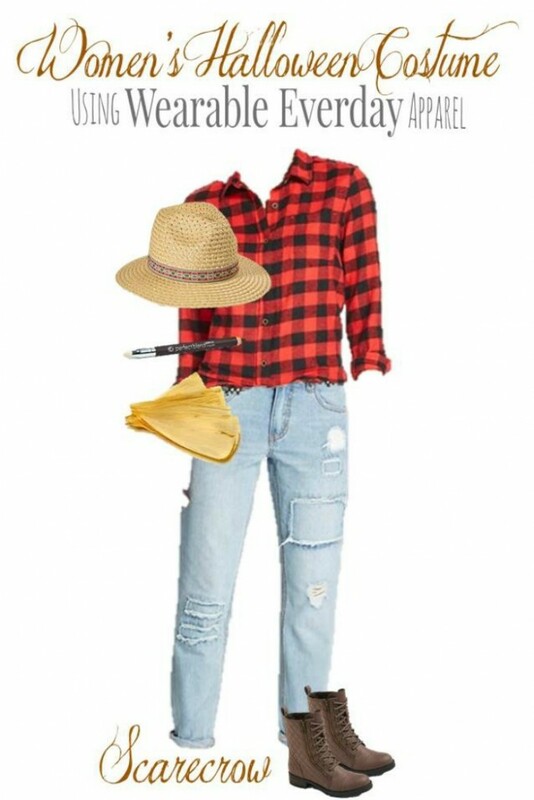 This DIY Scarecrow Halloween Costume is so easy to put together, too. The best part – the items can be worked right into your normal wardrobe after Halloween. We originally posted this in 2015. Since then, many items have sold out. We have substituted similar items for the DIY Scarecrown Halloween Costume that have the same feel, but may be slightly different. Links may be affiliate links. Distressed Jeans With Foldover Cuff – Every good scarecrow needs a pair of jeans. These are the perfect amount of distressed, and will slide right into your wardrobe after Halloween. Available up to a size 20 with petite and tall versions available, too! Women’s Lace Up Winter Utility Boots – These are a great pair of all purpose shoes. They’re not only perfect for this DIY Scarecrow Halloween Costume, but for fall and winter. Combat boots are a huge trend. CoverGirl PerfectBlend Eyeliner in Black/Brown ($5) – Not only is this a great eyeliner, but you’ll need this for adding the details to your scarecrow costume. Corn Husks – This gives the authentic, finishing touches to your DIY Scarecrow Halloween Costume, and is less scratchy than straw. Use the brown eyeliner pencil to draw a triangle on your nose, and stitch lines in the corner of your mouth. Pin the corn husks coming out of your pant legs and the cuffs of your sleeves. Check out our other DIY Halloween Costumes, too! This is an easy costume idea. I love how easy and convenient this costume is! I think that everyone would have these items on hand!